Inspired by my visit to Steve Edney’s garden at Sweetbriar, where a striped bromeliad sat astride the branches of an old cordyline, I decided to look beyond the terrestrial and think about what I could grow in my own trees at The Watch House. I am accustomed to seeing ferns nestled in the boughs of mossy trees in Devon and Cornwall, but this is a rare occurrence as far east as Thanet. Here, rainfall is half of that in the west, ruling out the cultivation of anything averse to drought either in the ground or above it. I needed plants that would cope with dry weather, have instant impact, live outside in summer and that would not be too much trouble to look after. 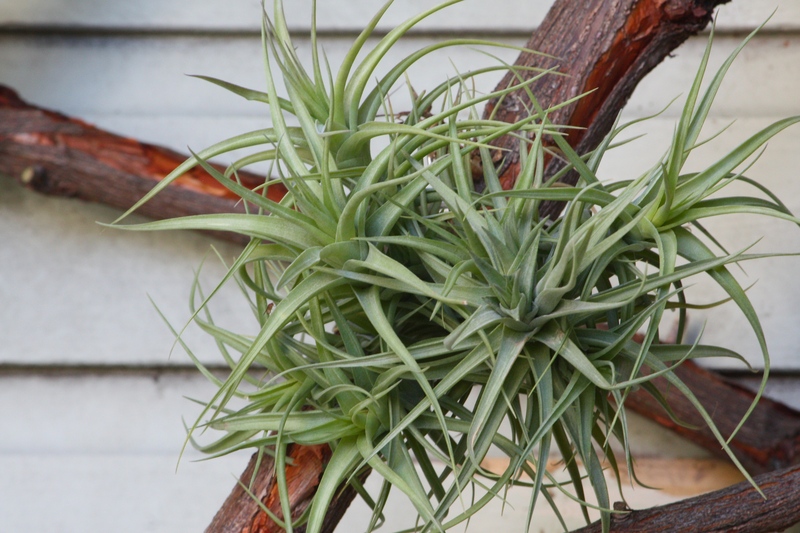 Having stumbled upon an excellent article on growing bromeliads outdoors in the UK, I decided to find out more about tillandsia, commonly known as air plants. The author of the article, Dr. Maciej Pomian-Srzednicki gardens at ‘Southern Comfort’ in Torquay. He clearly knows his stuff and shares his knowledge freely and fully on his website pomian.co.uk. 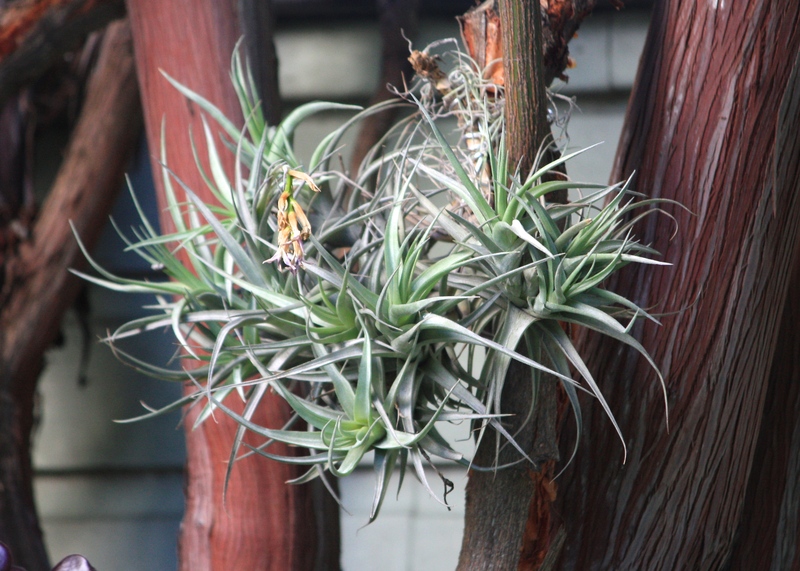 Based on experience in his mild coastal garden he recommends two species of tillandsia – T. aeranthos and T. bergeri – for both hardiness and robustness. Tillandsia hail from Central and Southern America and many are adapted to arid environments, especially those species with foliage that appears silvery. 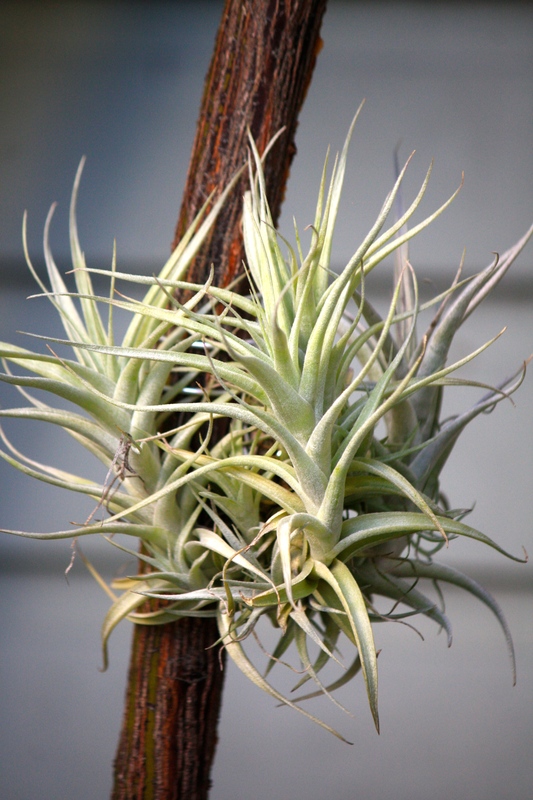 Epiphytic tillandsia – those that live without soil – have roots purely to anchor themselves in position. They take in all the air, water and nutrients they need through their leaves. The following day I got in touch with Crafty Plants, a small, specialist air plant nursery in the North West of England. They listened carefully to my requirements and asked for some photos of the proposed tree host, a shaggy-barked Lyonothamnus floribundus subsp. aspleniifolius. 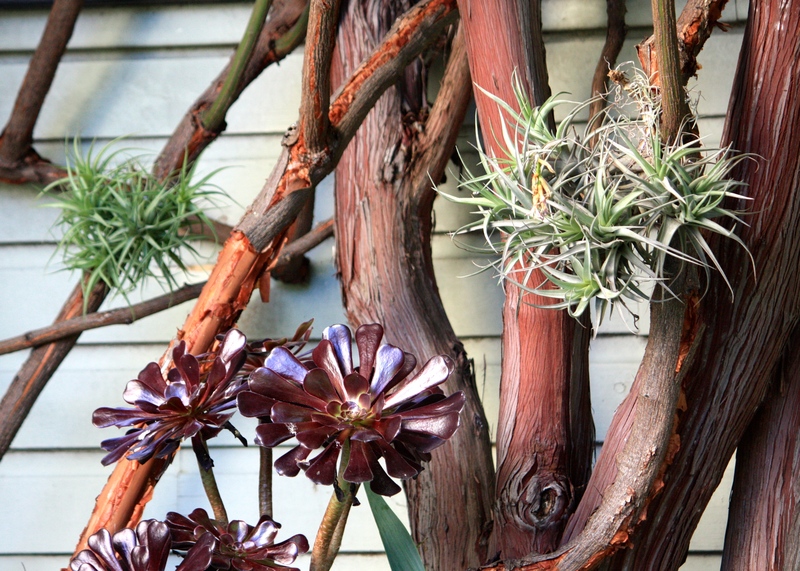 I thought the silver-grey tillandsia would provide an interesting contrast to the faded reddish bark of the tree, also known as Catalina or Santa Cruz ironwood. A weekend passed and back came Alex from Crafty Plants with photographs showing generous clumps of T. aeranthos and T. bergeri, in doing so corroborating Dr Pomian-Srzednicki’s recommendations. I settled on a large clump of T. bergeri and a slightly smaller clump of T. aeranthos, endeavouring to achieve a compromise between expense, my lack of expertise and a desire for instant impact. 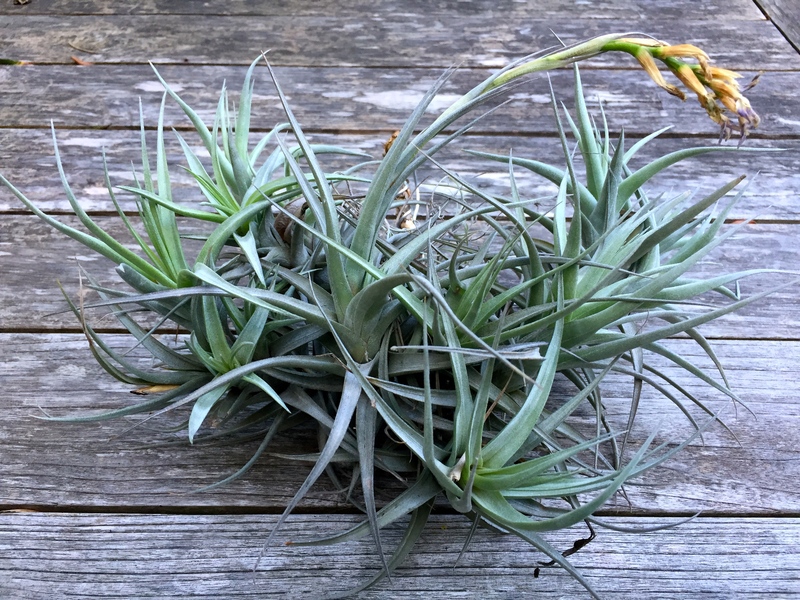 Tillandsia bergeri comes from Argentina and grows naturally at high altitude. It is considered ‘adaptable’, which is ideal given we need to learn how to get along with one another. T. bergeri also produces offsets throughout the year, meaning it quickly creates an impressive clump. When it flowers, the petals emerge violet from pink stems. The plant I received (above) still had a spent flower spike attached, giving me hope that it might not be long before another is produced. Tillandsia aeranthos produces darker blue flowers from a pink spike. 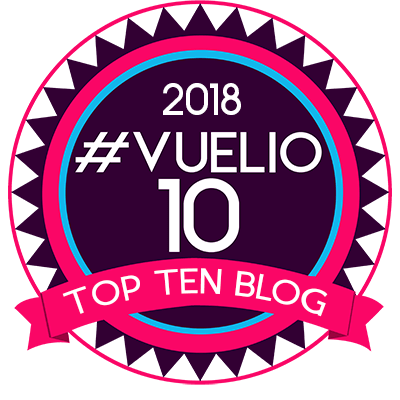 In Latin America they are charmingly known as ‘Claveles del aire’ (‘carnations of the sky’). 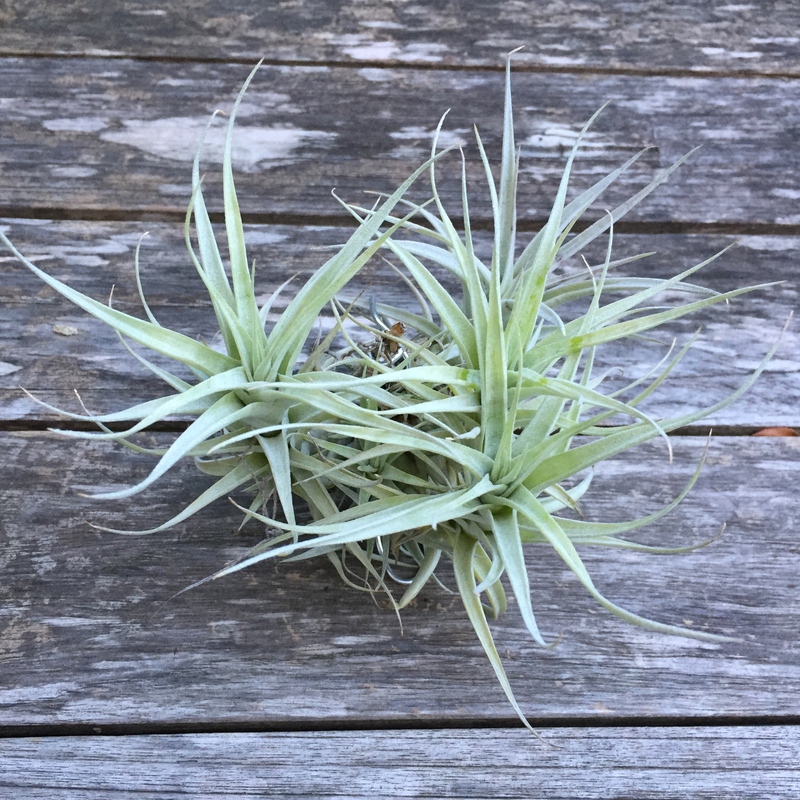 T. aeranthos is one of the hardiest airplants and the most commonly recommended for growing outside in sheltered, frost-free gardens. It’s another generous clumper. 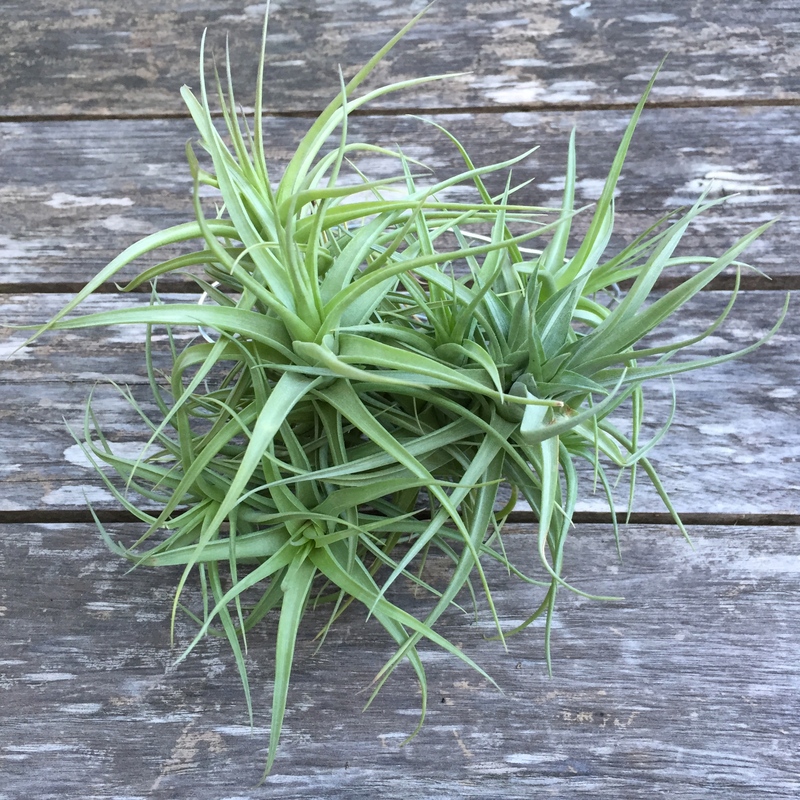 When my parcel arrived the following day I was delighted to discover that a small clump of Tillandsia albida had been included free of charge. 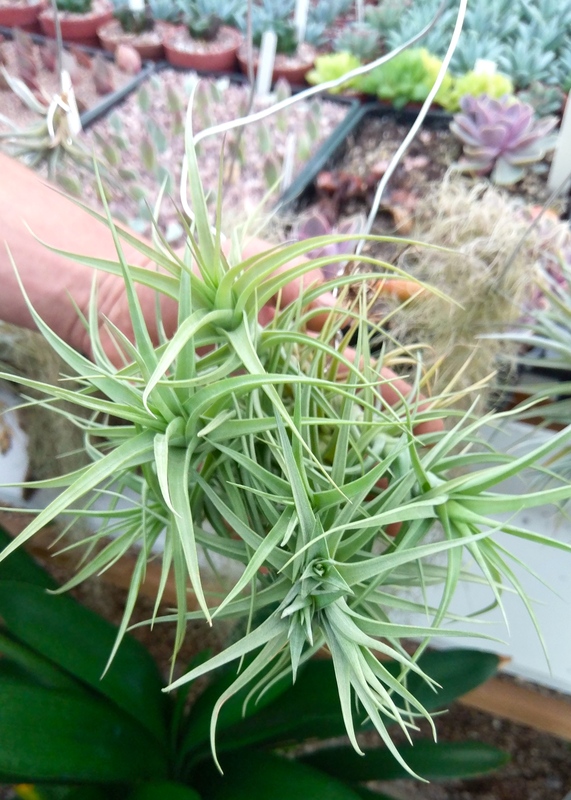 T. albida is one of the palest tillandsia and prefers bright, warm positions. It’s native habitat is Northern Mexico, which has very few similarities with Broadstairs. However, it’s also billed as ‘adaptable’ so I will give it my best shot. In the wild T. albida grows as either an epiphyte or is saxiphytic – i.e. it grows on rocks. 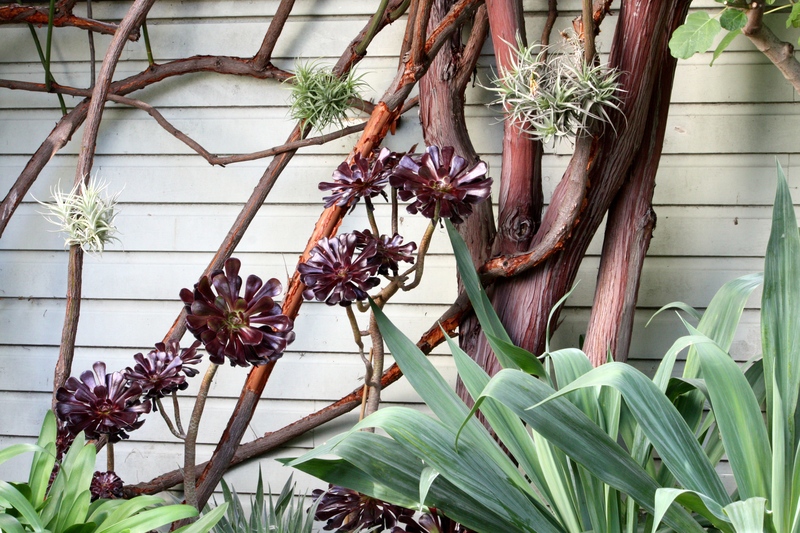 When the plants produce flowers from deep crimson spikes they are cream, which is a rarity for tillandsia. I’ve attached my bonus plant to one of the exposed stems of Rosa banksiae ‘Lutea’ where it will catch more sun than the other two species. Happily each tillandsia arrived with a length of soft metal wire already attached. I secured them to their hosts without delay, anxious not to keep them in the box or the house for too long. Dr Pomian-Srzednicki recommends using cable ties to fix tillandsia in position, but as no-one in Broadstairs sells the clear kind, I went with the wire and tried to disguise it as much as possible. One piece of advice I did not adhere to was fastening them upside down to prevent rain sitting in the leaf rosette and causing it to rot. Where I have positioned them there is quite a pronounced rain shadow, so they should not get soaked very often. This morning, for the first time, I sprayed my tillandsia with bottled water. Tap water in these parts would have far too many additives for it to be palatable to air plants, which like only like pure rain water or dew. How will my tillandsia fare? Well, I will keep you posted. Attached securely and in a position where they receive dappled shade for most of the day they should be fine. I have half an eye on the family of magpies that live in the tree, but so far they seem disinterested. They’ve probably never been to Central or Southern America and don’t know what they are looking at. Neither have I, but I do know they have done the trick in terms of bringing some interest to a corner of the garden I have neglected to reinvent for some time. I will bring the tillandsia indoors when the temperature drops in autumn as these fine plants are much too valuable to be taking risks with ….. and I am putting money on this winter being a lot colder than the last two. TFG. If you are interested in growing tillandsia indoors or out, I could heartily recommend my experience with Crafty Plants. They look great, lovely with the ironwood bark, well wired too, you can’t see it at all. I have been wanting a bit of interest up high as well and perched a pot of Russelia equisetiformis on a stone ledge sticking out of the side of the house, not that it has loved this wet August….a dire shortage of Hummingbirds to pollinate it as well. I had hopes of the hummingbird hawk moths in the garden but haven’t seen them on it yet! Just a question, Dan. When you detach them for winter, will it harm them in case they formed roots to the host plant? I attach mine to a piece of fern trunk and this to any location I fancy. Easy to take them to a better place when our blasts from the central Aus start blowing. ‘I don’t know’ is the answer Barbara. I had assumed from what I had read that roots were produced so slowly that they’d be unlikely to take hold within a single summer season, but I will ask the experts. Interested to hear that you grow them outdoors – do they do well for you? I must say it depends, I have a corner in the garden under a tree where I have maidenhair ferns spreading like wildfire and they like that spot but under the pergola where the hot winds blow sometimes, I have to change their position and mist them. After all Perth is not Sydney or Brisbane. My mother gave me an ‘air plant’ decades ago and it lived on the fridge door, attached to a magnet. It was wonderful, every few days it started to look sad and I sprayed it with rain water, it picked up and looked lovely again. This was a regular cycle for years until I moved house and sadly lost it. This was in my ‘pre-gardening’ days, and I know that yours will receive tons of care in comparison and look marvelous. Monty had a section on air plants last night on gardeners world. I’ve finally watched it. They are the chaps that supplied my plants. Now I want to experiment with even more airplanes!